It sounds like you found some good buys! I’m glad it does a good job. I would be upset with anyone who has curls and makes them straight. I would LOVE to have curly hair. My hair is pin straight and I can’t get it to do anything otherwise. It’s very annoying. I’ve never heard that huge hot plates were bad for your hair!! Damnit.. that seems logical though. I love my 2″ plates because I get my hair straight really fast. I need a new straightener bad. I love small ones, but for long hair, it can be quite a pain. You know I love your hair best straight! You look so pretty! But I agree, your curls are very beautiful, and natural is awesome. Every once in a while, straight hair is a good mix with the usual wild curl. That’s a good deal on a straightener, but I usually just let my hair dry wavy because its so thin and damaged I don’t want to ruin it anymore than it already is. I lovessss it Although your naturally curly hair is love, I still like when you straighten it. Nice deal! I also have natural curly hair but almost everyone I know loves my curls because they’re like big rings or something. Well actually, WERE LIKE BIG RINGS because ever since I got my hair rebonded, the pretty ring curls never came back. However, you look awesome with straight hair, too — I say do it more often! It’s so sleek looking. ? That’s such a cute looking straightner. I have a chi, myself. I also have big curly hair, but I straighten it nearly everyday. I’m the opposite of you, while they’re nice now and then, I really don’t like the way I look with them, and since I like to pin my hair in so many different ways, its just easier to straighten it, even if it is more work. Its true what you say though, you look like a different person. $29.99 is a great price for a hair straightener. The one I have isn’t all that great, so I might head up to Ulta and buy one like this. You’re lucky to have curls! Mine is naturally wavy, so if it air dries it puffs out and is so horrible, so I straighten my hair everytime. I got the instyler for Christmas (which is fairly pricey) but actually works fairly well for me! I’d like to invest on a good curling iron and flat iron too…someday. Hmmm. Oh I envy you because you love your curly hairs, I hate mine. Because I’m wavy. Anyway, I love your hair straightening. That is such a cute straightener. I’m going to need a new one soon, so I may look into that! How did the got2b work on your hair? I’ve used other straightening products before, and none of them seem to work, they just make my hair MORE frizzy! Great price & makes your hair look awesome! Can’t be that! You look really good with your hair straightened! The curls are lovely of course, but like you said, sometimes it’s nice to mix it up a little. And wow, a $30 straightener that works that well is really something! I’ll have to look for something like that here…my old straightener (wherever it is now, lol!) is a “dinosaur” too. We can dispute a lot about the historical knowledge of research papers writing, but I would tell that the essay help service can accomplish the prominent university essay always. Is this right? It looks nice straight! I’m never able to use a straightener. 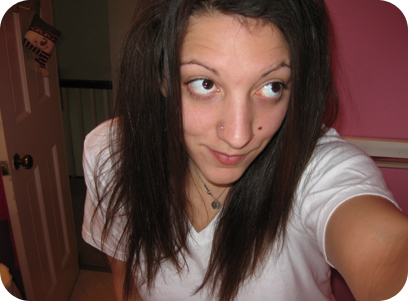 Everytime I straighten my hair, you can see how …unvolumey it is. Blah, I’ll keep my scraggly wavy hair, but I do like how yours looks! You look nice when you have straight hair, and your curly hair looks nice as well. Good buys you got there! Nice! My straightener is getting pretty old as well, I’ll keep an eye out for that one. It is a cute little thing. I have big funky waves and my hair is really thick like yours. It takes me FOREVER so I don’t even bother doing it everyday. Ohhh la la, pretty sraightener! I wish I had curls, my hair is just wavy and too thick. I had to buy a straightener for my girlfriend. I got it from Walmart a few years ago for like $20, it is a wet dry one, apparently it is the best one she has ever owned, which is weird since her grandmother owns the beauty salon store downstairs. 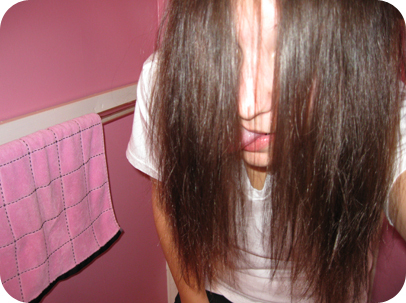 Haha you look like the girl from the RING when you’re hiding behind your hair. CREEPY!!!!! Yeah, I bet it looks better curly… of course, you should keep it that way anyway or else you might need a new domain! heehee. My hair is the same way. You look pretty no matter what, though. Your bathroom is soooo cute an pink! 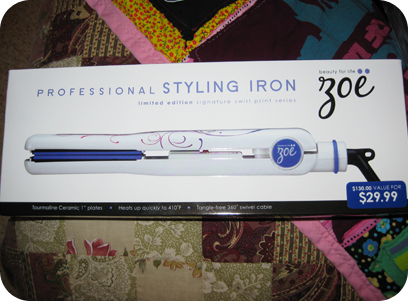 I love my Zoe iron! Don’t have cash to buy some real estate? Worry no more, just because this is possible to receive the loans to work out such kind of problems. Hence get a car loan to buy all you require. The thesis proposals performing process seems to be interesting but time taking. So, when some people want to relax and write their imazing story related to this topic, they should to look for the trustworthy thesis service, which can support people everytime. This topic is superb! Some times I failed in my exams and got unsatisfactory grades, as long as friend of mine advice me this site! I buy essays and now I know how to make elegant papers. Don’t search for success if you want it, simply do what you love and consider in, and success will come with our professional research paper writing service. The customized essays composing canâ€™t constantly be a kind of fun. The online research paper can take a lot of time and efforts. I would advice to buy research paper. I do think that this is the most simple way. In the beginning, I started to read your theme and didn’t believe that would be so good enough. Last time I saw the term papers of such quality. I thought that only the assignment writing service would be able to complete the good quality custom essays. There is no other easy way to have good grade than to complete the free essays related to this topic but thatâ€™s, besides, reasonable to order the poetry & poets essays paper in the essay writing service scam. wow lady, you are looking good because of your new tool. I wish I had a hair toy like that! All looking so nice.Thanks for this nice info. Your website is great. When is the next post comming on this topic.I’m happy I found this blog. Agree with the guy, the passion is very strong motivation in choosing career, but also you should remember to stand all the learning curves in this field. As for me some times it becomes boring what I do, but just sometimes. Itâ€™s not always a bright days in our lives. So choose what you like and what you can think will bring satisfaction in your mind. Funny how no one seems to catch the fact that some local Chambers wish to keep from being blown up by the likes of SIEU thugs that have proven they will beat up opposition minding their own business &/or bite fingers off of them, as they did last year, thus choose not voice their views at times.Like the fraud that called a press conference in DC late 2009 — and were busted by the US Chamber. Hilarious! Our companies have been members of the local Chamber for many years. Why is MJ dead set against them? Because their views differ than yours? Happy to see your blog as it is just what Iâ€™ve looking for and excited to read all the posts.